Living a double life as a school girl and an idol might be tiring for some, but Komugi Yoshida is excited to be living her dream, despite her own lack of popularity. Even as her two closest friends’ popularity rises, Komugi continues to work toward her goals! One day, a strange creature materializes in front of Komugi and gives her the choice to transform into a Legendary Girl! 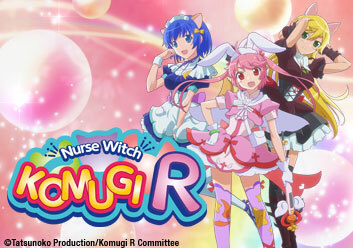 Thus, Komugi takes on yet another role in her life as a Magical Nurse in this adorable magical girl parody! When a strange rabbit-like creature asks Komugi to save the world by becoming a Legendary Girl with an embarrassing outfit, Komugi does the only logical thing: she runs away! A Stalker?! Cocona-chan's Close Call! Kokona’s been feeling someone’s eyes on her lately. Is it a stalker, or something else entirely? When the truth comes out, Kokona discovers an interesting new side of herself! Magical Nurse and Magical Maid encounter another rival for the Fan-C cards. Meanwhile, what secret is Kokona’s co-star, Tsukasa, hiding behind her princely visage? Everyone's Ninjas at the Edo Mansion! Komugi is honing her stealth, strength, and ninja knowledgefor a chance to win the title of Ms. Kunoichi. However, on the day of the competition, a slimy surprise awaits! Trouble Rendezvous at the Study Session! Deplorable grades are threatening Komugi’s acting career! Kokona proposes a study group, but things get interesting when Tsukasa is left alone with her crush, Yuto! Komugi accidentally discovers Tsukasa’s very girly room, and Tsukasa faces the possibility of revealing her true self to the world (and to Yuto) at an upcoming swim meet. Kokona is having an idol identity crisis, and every time she tries to change her image, it backfires. Can she discover her true strength before she destroys her reputation? Yuuto Gets Nowhere with Love! A relaxing hot spring adventure is out of the question for Komugi! Yuto schemes to bring Kokona and Tsukasa together, while Tsukasa gets the wrong idea about Yuto and Komugi! Komugi’s hot spring reports are a hit, and things couldn’t be going better for her. That is, until she overhears that she’s going to be fired! Tsukasa prepares a White Day present for Yuuto, but a whip cream monster in the school kitchen puts her identity as the Magical Sister, and her cupcakes, in danger! A new idol is coming to Japan, and her agency begins to put Komugi, Tsukasa, and Kokona out of work! Meanwhile, Usa-P, Neko-P, and Tanu-P return from the Fanta-C World. Komugi comes home to find Usa-P terribly wounded with all of his Fan-C cards stolen. When Lilia’s concert is attacked, will Komugi have to reveal her identity to her friends?